Sunday lunch is one British tradition worth observing. All you need is a lazy afternoon, an expandable waist line, good company and more Sunday papers than you could ever hope to read. London is packed with places offering fantastic Sunday menus covering everything from authentic roasts with full trimmings to lighter lunch options. This Italian take on the traditional Sunday roast is a perfect upmarket alternative. If you're looking for something a bit more special than your standard pub roast dinner, then Sartoria in Mayfair is for you. The upmarket Italian restaurant has launched a sharing-style Sunday roast that perfectly marries the Italian cooking of Francesco Mazzei - the restaurant's Chef Patron, who also recently opened Radici in Islington - with aspects of the traditional British dish. For the focal point of the meal, diners can choose between typical roast dinner staples such as chicken and lamb or more unusual offerings like suckling pig, veal rib and roast goat, all of which are theatrically dished up at the table and served with deliciously al dente vegetables and moreish potato wedges - trust us, you won't miss the roasties. Washed down with a glass of fizz or wine, chosen by the attentive sommelier, and finished with a beautiful deconstructed rhubarb tart and you've got yourself a Sunday lunch to remember. Jason Atherton's Berners Tavern is a fun, fabulous place to have lunch. For minimalist warehouse chic in the middle of the East End head down to this converted factory. Its whiteness, high ceiling and hanging lights (not too bright) just add to the effect, which is elegant and stylish. You'll find unpretentious classic dishes, bringing together choice influences from French and English food. The whole vibe is effortless - understated sophistication at its best. Strangely, the restaurant is not open for lunch during the week. This is a shame for both them and us as they do a roaring trade on weekends. The brunch menu is a real treat and is served with a delicious soundtrack of pop hits played on their baby grand piano, courtesy of resident musician Xavior. Bistrotheque used to host regular cabaret evenings, but came over all grown up with a refurbishment which saw the addition of two new areas including a central American Manchichi wood bar, and a private dining room on the ground floor. The Manchichi bar comes with its very own menu and drinks list, think charcuterie, oysters, classic mains and little nibbles washed down with a classic Negroni, French 68 or a Sidecar. Downstairs the private dining room can seat 100 guests and caters for everything from parties to proclamations. This pioneering organic pub has done a good job of going gastro without losing the atmosphere of a proper boozer. In part, this is due to the quantity of tables and chairs they've crammed into the stripped pine main bar, forcing people to share and creating a buzzy, convivial atmosphere that works well whether you're on a birthday party or a date. It's also due to an excellent range of organic micro-brewery beers, which keeps the CAMRA types happy, even though the decor's a bit lighter and airier than they might like. They are exceedingly proud of their title as Britains first and only certified organic pub and the ethical values mean the food is really thoughtfully prepared. The short menu - pies, roasts, whole fish and stews - has some mouth watering dishes like the pigeon breast wrapped in bacon with brussel sprouts and chestnuts. There are also a few creative veggie options, like the savoury butternut squash, almond and mascerpone 'cheesecake.' It's a bit on the pricey side but you're paying for superb ingredients and it's not hard to see why the Islington locals keep coming back for more. Carnivores will be delighted with the opening of this branch of Hawksmoor restaurant in Covent Garden's Seven Dials. Will Beckett and Huw Gott's British steakhouse and cocktail bar, whose flagship venture in Spitalfields fast became a favourite amongst the capital's meat lovers, gets a West End makeover with this second enterprise on Langley Street which opened in November 2010. The subterranean venue (which seats 128 in the restaurant and 50 in its stylish cocktail bar) is housed in a former brewery and looks slick: Victorian cast iron columns hold up a vaulted ceiling above Manhattan-style exposed brickwork walls and oak panelling; the tables are spruced up casts-offs from old laboratories, while the lower walls are also covered from tiles sourced from London Underground. But it's all about the steak: sourced from the Ginger Pig's Yorkshire farm, some of these succulent slices are aged and hung for a whopping 55 days. Besides the steaks, the Hawksmoor Burger with crunchy beef-dripping chips has legendary status, while the menu also boasts the likes of lamb chops, lobster, ribs, oysters and sausages. There's an express menu for lunch and pre-/post-theatre which includes two courses for £22 or three for £25, while the Hawksmoor Sunday roasts have been championed by the Observer Food Monthly. It's rather expensive, but for steak this good it's money well spent. Set your bearings north to Islington where Penton Street meets Chapel Market and you'll find The Compass pub. Along with a name change (dropping the fishy sounding part of its previous moniker, 'The Salmon & Compass', in June 2009) comes a shift in atmosphere away from party venue to gastro pub. Under the ownership of John Rentsen and Charlie Silver (who also own The Green in Clerkenwell) The Compass exchanges weekly DJs for a seasonally adjusted daily changing menu. The refurbished space has a shabby chic appeal with exposed brick walls teamed with chandelliers and a 30 foot oak panelled bar. At the bar you'll find Alton's Pride alongside Cheddar Valley organic cider as well as bottled beers like Modello from Mexico and Portugese favourite Super Bock. An extensive wine list complements the offerings from the open kitchen - how about a rich glass of Argentinian Malbec to go with your duck scotch egg; or a Muscadet Sèvre et Maine to set off a sea bass based fish stew? On a hungover morning, head straight for the black pudding sausage roll washed down with a bloody mary. They haven't completely done away with the music and DJs - upstairs there's an elegant private room with its own bar, PA sound system, projector and decks. Berkshire sourced game and wild produce, plus signature dish: a venison Scotch egg. Anna Hansen hasn't moved far from her former employer Fergus Henderson - whom she worked with back in 1992 at The French Dining House Room - setting up her Clerkenwell restaurant, The Modern Pantry, just down the road from his landmark eaterie, the St John. Overlooking St John's Square, this is a second venture for the New Zealander who used to co-own our favourite Marylebone tapas fusion place, The Providores. With such a culinary pedigree it's no surprise that The Modern Pantry opened to great excitement in August 2008 and, over time, has proved that it more than lives up to the hype, expanding to a second Modern Pantry in 2015. With a ground floor cafe, first floor restaurant and pantry (deli) under one roof, you can sample the internationally influenced three course menu, order birthday cake or take a sandwich away for lunch. We'd recommended settling in for the full experience, sampling innovative dishes like red cabbage and miso soup and cassava chips served with tomato chilli jam and crème fraiche. Mains continue the treat for adventurous eaters - with choices of sake and soy butternut squash risotto dressed with cashew and mint pesto, and roast pork belly with chocolate and balsamic vinaigrette. For afters, Earl Grey panna cotta served with blackberry and liquorice jelly or chocolate mousse cake with tamarind caramel and cocoa chilli crumbs are typical of the tempting choices that you'll surely find room for. Everything about the Dean Street Townhouse is very British from the Grade II listed four-storey Georgian building to the Dining Room with its "nursery-food menu" and "Brit-art in the restaurant" (The Independent). The first joint production by Nick Jones, founder of Soho House, and Richard Caring, who owns The Ivy, Le Caprice, Scott's, Annabel's and others, Dean Street Townhouse feels like it's been on this Soho street for a hundred years even though it only opened in 2009. It's not easy to do but with this restaurant the duo have created "the perfect French brasserie serving delectably simple English food" (observes Matthew Norman in The Guardian). And unlike its sister establishments - exclusive London members' clubs Soho House, The Electric and Shoreditch House - you don't have to be a member to eat or stay here. The menu is full of nostalgic comfort food from mince and potatoes to fish and chips with mushy peas with fruit scones for afternoon tea. 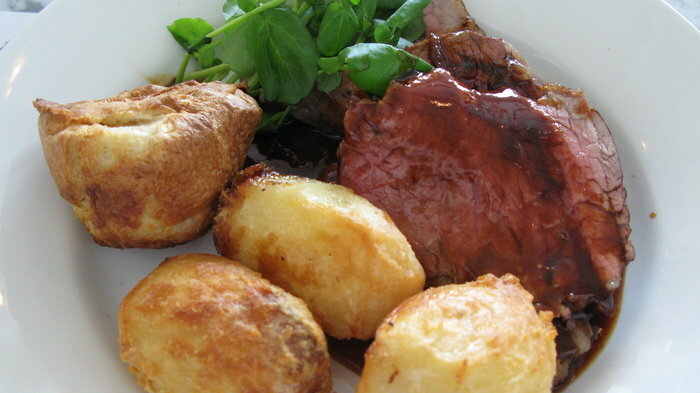 The style is fashionably homey and the roast dinners are seriously indulgent, Banham chicken or Hereford beef both come with Yorkshire puddings, roasties, cauliflower cheese and honey-roasted veg. You can sit on red leather banquettes in the main dining room, in vintage armchairs in the lounge, or on high stools at the bar while taking in the impressive art collection featuring works by contemporary British artists like Paul Noble, Keith Tyson, Peter Blake, Tracey Emin, Mark Titchner, Fiona Banner, Keith Coventry and Mat Collishaw. Accusations of style over substance haven't stopped this place from building up a chic loyal clientele and a smattering of celebrity supporters. "The perfect country pub" says Jay Rayner in The Observer. Serving elegant British food, using the best seasonal, specialist and wild produce from around the UK, Newman Street Tavern is "the perfect country pub" says Jay Rayner in The Observer. He singles out an onion tart with "stupidly thin and delicate" pastry for special praise and highlights the brunch at weekends: brown trout Benedict, Galloway sirloin with egg and chips, green shore crab bisque and the like. The very finest British shellfish, the best free range quails and chickens, properly hung game, fresh vegetables and herbs, not to mention wild produce at its peak are all served in the beautiful dining room just north of Oxford Street. Wines come from small producers, craft beers and regional ales share the bar with a classic cocktail list which changes with the seasons. Indulgent Sunday roasts in a sophisticated setting. From cheap budget accommodation to luxury 5 star hotels see our deals for hotels, including Holiday Inn Express London- Vauxhall Nine Elms from 57% off.